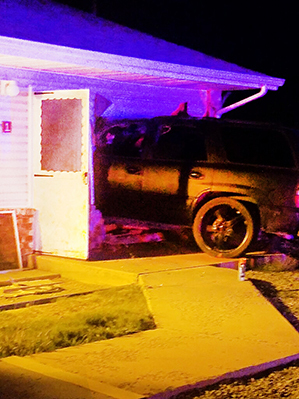 An Artesia thief was arrested Monday after leading police on a brief pursuit, and his abandoned getaway vehicle rolled into the side of a local home. Artesia Police Department officers were dispatched just after 1 a.m. Monday to the 2800 block of West Missouri Avenue in reference to a suspicious vehicle. While en route, officers spotted the vehicle pulling a power-washer trailer away from the area with its headlights off. Believing the washer to be stolen, police attempted to negotiate an investigatory traffic stop, but the suspect vehicle fled. Officers pursued the SUV through the neighborhood before the driver jumped out. He did not put the vehicle in park, and it subsequently rolled into an apartment in the 1600 block of West Centre Avenue. The incident caused significant property damage but no injuries. The driver, identified as Pedro Esquibel, was apprehended a few hundred feet from the SUV. He was subsequently arrested and charged with larceny from a motor vehicle (over $2,500 but not more than $20,000), aggravated fleeing from a law enforcement officer by vehicle, possession of burglary tools, and resisting, evading or obstructing an officer. Esquibel is being held without bond at the Eddy County Detention Center. He is scheduled for arraignment before Judge Daniel Reyes Jr. at 10 a.m. Thursday in Artesia Magistrate Court. Esquibel was bound over to district court June 20 on charges of larceny (over $2,500 but not more than $20,000), conspiracy to commit larceny (over $2,500), tampering with evidence, and receiving stolen property (over $500 but not more than $2,500) stemming from a Dec. 11, 2017, incident involving tires stolen from Forrest Tire.